Club Philosophy | Yankee United F.C. Yankee United F.C. of Connecticut was formed in 1992 to promote the highest level of competitive soccer in the state for aspiring young female players. In the clubs inaugural season a tradition of excellence was established as Yankee United girl’s teams garnered two Connecticut Open Cup State Championships. The tradition has continued from 1992 to 2012 as Yankee United F.C. teams have won 45 State Championships, (44 on the girl’s side). In 2003, in an effort to fill a need in Southern Connecticut, Yankee F.C. piloted a U-12 team boy’s team, Yankee United Real. Team Real earned a State Championship at U-16 earning finalist or semi-finalist honors over the past four years. Yankee United F.C. teams have produced 11 All-Americans, 33 All New England, and 175 players that have earned All-State Honors. Typically, Yankee United F.C. 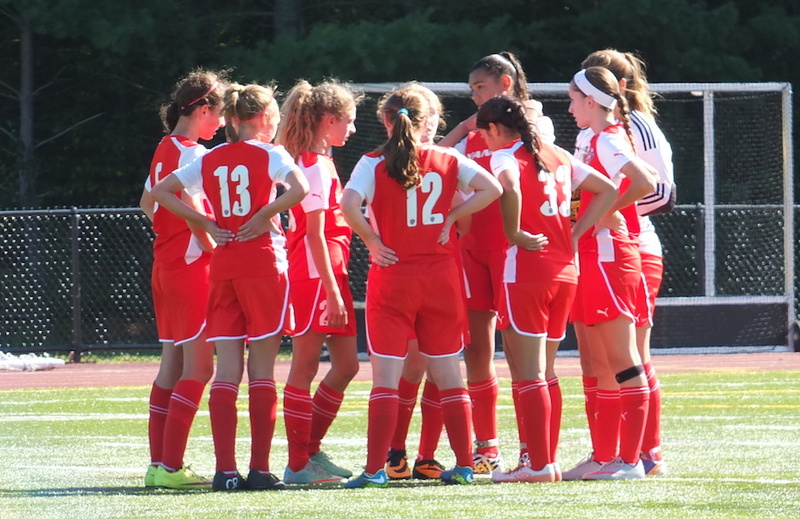 Players are represented on the Connecticut ODP Teams as well as the ODP Regional Pool. Yankee players have been selected at the U-14, U-16, U-18, U-20, U-23 US National Team Player Pool, as well as, at the full USWNT level. Some of Yankee Alumni include: Arizona State University graduate, Manya Makoski who was recently drafted by Los Angeles Sol of the Women’s Professional Soccer League (WPS) and currently playing for the Atlanta Beat. Boston College graduate Kia McNeil who is also playing for the Atlanta Beat, as well as, representing the United States at the U-23 level, U-20 National Team and Penn State/Boston Breakers goalie, Alyssa Naeher who was recently called into the U.S. Women's National Team. Yankee yearly sends its players to the most competitive colleges and into Division I programs that afford athletic scholarships. Over the past years Yankee players have excelled at the most prestigious Division I, II, & III programs including Harvard, Yale, Princeton, UConn, Boston College, Georgetown, Fairfield, Penn State, Notre Dame, Hofstra, Marist, Fordham, Skidmore, Tufts, Delaware, Colby, U. of South Carolina, High Point, Elon, Boston U., URI, Siena, Cincinnati, Arizona St., Navy, Messiah, Bucknell, Temple, Ithaca ,St. Michaels, and Holy Cross. Yankee Soccer is the stepping stone to these academic opportunities. The Yankee experience for ages 7 to 11 will stress player development with an emphasis on individual and team possession skills in a positive fun atmosphere. Comfort with the ball, ball control, 1 v 1 attacking skills, playing in small spaces under pressure will be the main focus for this age level. To play at the premier level of soccer a player must have these skill sets to be successful. Yankee United at the U11 to U19 age groups is committed to providing the highest level of training and competition possible. The Yankee reputation as well as our Adidas sponsorship gives our club and its players an edge in getting our teams accepted to some of the top youth tournaments and college soccer showcases in the country. Training at this level will continue to concentrate on the player’s technical development, to tactical recognition and decision making with an emphasis on speed of thought and play, which is what we strive for. Yankee United F.C. is committed to helping each player be the best they can be. In turn there is an expectation that the Yankee F.C. high school age player commit to making soccer their number # 1 sport. The player and coach will practice and play a minimum of 3 to 4 days a week from November to June with the collaborative ultimate goal of the athlete playing soccer at the college level. To maximize this process the player, parents, and club must all be on the same page. Yankee United F.C. will only field teams in age groups that meet the club standards of a quality premier team. Yankee United F.C. will not allow players to “play up” unless it can establish that the player playing up would be at a level that would place the player in the top tier of players on the older team. Yankee feels strongly that having success at an age appropriate level is more beneficial for the player’s development than being an ancillary player on a year older team. Conversely if a player can excel while playing up, challenging the player in that environment would best enhance their development. Yankee United F.C. is made up of a group of coaches who share the same goal. To help develop our club players to be the best soccer players they can be. Although coaching soccer is not their primary job, they coach because it is there passion. It is not a business, but a love of the game. As a result Yankee F.C. coaches work hours well beyond the call of duty. They are educators, professionals, and former college players with years of experience that you can communicate with and depend on to give the players an experience that will improve them significantly, one they will never forget.